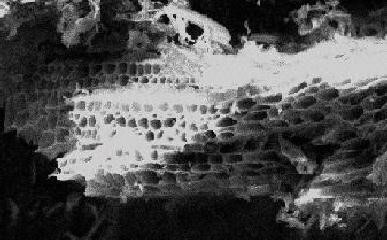 Pore structure of activated carbon The activation process (by steam or chemicals) can only "develop" an activated carbon skeleton, using the building blocks supplied by the original starting material. The produced activated carbon skeleton defines the pore structure and thus the performance of the activated carbon product in an application. Most carbonaceous materials do have a certain degree of porosity and an internal surface area in the range of 10-15 m2/g. During activation, the internal surface becomes more highly developed and extended by controlled oxidation of carbon atoms. Typically we can obtain surface areas of 700 to 1500m2/g, depending on the operating conditions of the production plant. Activated carbon is graphitic in nature; however, raw materials used to make the product are not. For example, coal is composed of a wide variety of large organic molecules and would not be referred to as graphitic. Cellulose, the base material of most vegetable carbons, is a polysaccharide consisting of a linear chain of several hundred to over ten thousand β(1→4) linked D-glucose units and thus not graphitic. Activation can be looked at as a process to convert non-graphitic coal or other starting materials into graphitic activated carbon. The activated carbon skeleton is composed of graphitic carbon plates that must be created from the starting material at elevated temperatures. The plates tend to be small and imperfect, and the size and degree of imperfection is related to the chemical building blocks provided by the starting material. The starting material is not graphitic, but the activated carbon graphite plate structure is inherited from the starting material because it provides the building blocks to create the graphitic plates. Coconut shell based carbon will have a predominance of pores in the micro pore range (high adsorption energy range) and these accounts for 95% of the available internal surface area. Such a structure has been found ideal for the adsorption of small molecular weight species and applications involving low contaminants’ concentrations. In contrast, wood and peat based carbons are predominantly meso/macro pore structured and are, therefore, usually suitable for the adsorption of large molecular species. Such properties are used to advantage in decolourisation processes. Coal based carbons, depending on the type of coal used, contain pore structures somewhere between coconut shell and wood. DESOTEC has a wide range of activated carbons to offer, based on different raw materials in order to provide its customers with an adequate answer to their specific purification or filtration needs. Don’t hesitate to contact us, we’re at your disposal!